Imogen's Typewriter. : Fiction Friday: Books I Read in August! So this is a little late but as you may know if you read my Impromptu BRB, I was out of the country last friday when I would normally have put this post up and somebody didn't think to take pictures before she left! 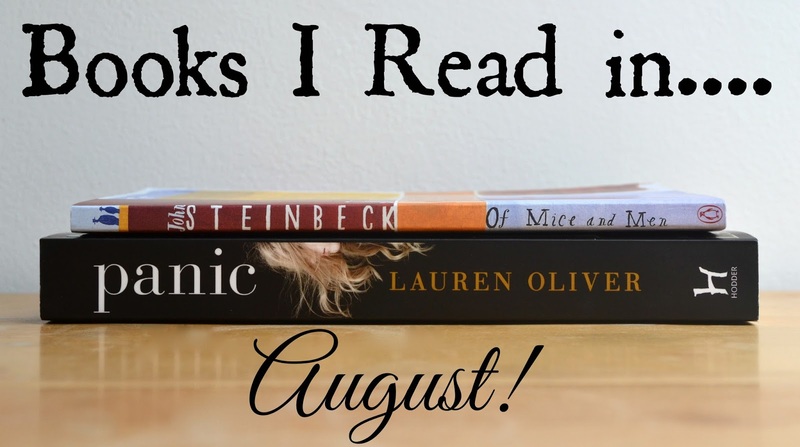 Anyway, I hope you forgive the delay- today I'm talking about the three books I read in August. Not pictured as I read an e-copy! I really enjoyed Outshine, I have a full review that you can read here and I'm still tempted to buy the paperback. If you're interested in reading some YA but dystopian isn't your thing, this is a really original YA Sci-Fi novel that I flew through. I'll admit that my interest in reading this book came from my love of Lost as it is referenced often. It's even Sawyers favourite book; "My favourite's Steinbeck; Of Mice and Men." I wanted something short to read as I had a bit of a book hangover and this was near the top of one of the piles of books I have. So I sat down and read it. And it was good, I can see why it's a classic and the commentary on the Great Depression is fascinating. I'd recommend it but.. There was one thing that stopped Of Mice and Men being a five star book for me and that was the treatment of women. Anyone in the comic book community and even some outside of it knows the phase 'Women in Refrigerators' which relates to Alex DeWitt being killed in Green Lantern and stuffed in the refrigerator to further the male storyline. Without going too much into spoilers (even though this book is from 1937), I had a Women in Refrigerators problem and I go more in depth in my Goodreads review if you're interested. To quote Steinbeck himself; Curley's wife is "not a person, she's a symbol. She has no function, except to be a foil – and a danger to Lennie." I have to disagree with Sawyer on this one. Panic, a legendary game played by graduating seniors, where the stakes are high and the payoff is even higher. Panic began as so many things do in Carp, a dead-end town of 12,000 people in the middle of nowhere: because it was summer, and there was nothing else to do. And who doesn't need $67,000?! I really enjoyed this book and I definitely need more of Lauren Oliver's writing after reading this. It was very fast paced and the characters were all pretty interesting. It had me crying out 'why?!' at certain points and I think it really got into the mind of teenagers and what drives them. And you can read my interview with the lovely Lauren Oliver here if you want to know more about how Panic came about! So that's what I read in August! What did you read? *I received a copy of this to review as part of the blog tour. ** I requested a copy of this book from Book Bridgr. This has not changed my opinion on either books. ***This post contains Amazon affiliate links which means if you buy anything from the links, I get a few pennies at no extra cost to you. Pretty neat, huh?